You are here: Home » The potential cost of a single meal versus life in the fast food lane. The potential cost of a single meal versus life in the fast food lane. You’re young and healthy and living life in the fast lane. You can afford to eat at the drive-thru at your local fast food eatery. After all, you should never skip breakfast. Well, you might want to rethink your actions. According to new research from the University of Calgary’s Libin Cardiovascular Institute of Alberta, even one breakfast meal of fast food sandwiches can have a negative impact on your arteries- within a short period of time. While there may be no long term implications from a single fat and sodium-laden breakfast, being a regular sausage, egg and cheese sandwich eater likely won’t bode well for your artery health. 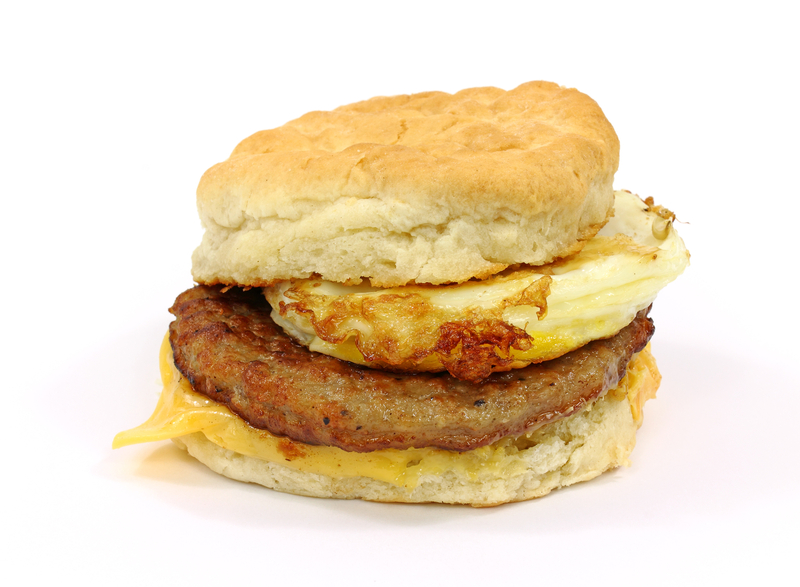 The research assessed the impact of eating two fast-food breakfast sandwiches in a small group of healthy people, ( average age of 23) on how their blood vessels dilated two hours after the meal. Measuring the dilation shows how well the blood flows through their blood vessels. There was a 15 to 20 per cent decrease in dilation of the blood vessels. While the researchers didn’t identify which sandwiches they used, chances are that many of the fast food breakfast sandwiches will have similar effects. So don’t be fooled by the sandwich being on a multi-grain bagel or muffin. Get your whole grains elsewhere. And by elsewhere, I mean home. Breaking the fast at in your own kitchen can offer you a healthy start to your day without a glut of fat or sodium and offer you an assortment of health promoting nutrients. But sometimes figuring out what to eat takes more time than actually preparing or eating breakfast. If you’re in a hurry, with no time to contemplate your options, make a list of speedy alternatives and post it on your fridge. Go for selections from at least three out of the four food groups. Leftovers from dinner may appeal or put together some lower-fat cheese cubes, whole grain crackers and a piece of fruit the night before and have it ready in the fridge. Where do you eat breakfast? Do you have any tips to share? Please do so in the comment section below.